Each Lecture is different. In some years, survivors of Nazi persecution recounted their physical resistance in face of hellish danger. In others, medalists considered the effect over the years that the bravery of friends and family has had on the course of history. Lectures have been given by politicians who explain why they resisted unjust governments and, in turn, worked to develop a new order, honoring their personal vision with decades of public service. Some medalists have focused on their missions: to reject a life of wealth and rescue people who are literally slaves of corrupt businesses; to devote a life to the non-violent and peaceful pursuit of human rights. What the Wallenberg Lecturers have in common is their ability to inspire all with their vision, and the reality of their strength to act upon that vision. Here is the power of an eyewitness account to convince us that, although evil truly occurs, with moral courage individual actions effect a change in the world. In their Lectures, the Wallenberg medalists reveal a common characteristic: they acted selflessly without expectation of reward. The Lectures are profiles of moral excellence in ordinary people. The words of the medalists help us to imagine how it is that some can see all people as human; they share a vision of human dignity. 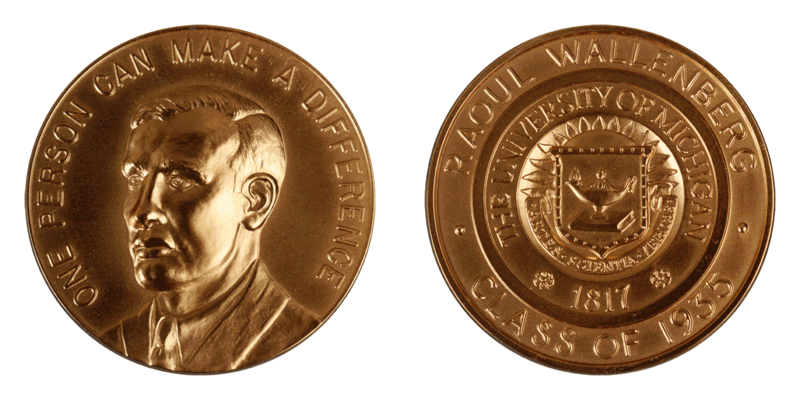 The Wallenberg Medal is the creation and gift of Jon Rush, professor of art and design at the University of Michigan. He first learned about Raoul Wallenberg because the School of Art and Design had been part of the College of Architecture where Wallenberg was a student. The University of Michigan has both a Wallenberg medal and a Wallenberg memorial. Rush designed the memorial and also donated this to the University of Michigan. His continuing interest in Wallenberg eventually led to the creation of a public sculpture on the campus which is a memorial to Wallenberg. The title of the sculpture is Köszönöm Raoul Wallenberg. (Köszönöm is Hungarian for “thank you.”) It also includes the words, “One Person Can Make a Difference,” carved into the surface of the granite and stainless steel sculpture. Since Wallenberg saved the lives of Hungarian Jews, Rush felt that this would be an expression of their gratitude. The memorial, located at the west entrance of the Art and Architecture Building, poetically addresses the man and his deeds. The sculpture was the gift of Jon Rush and the family of Sol King who was a classmate of Wallenberg at the College of Architecture. In 1995 this piece was dedicated by Swedish Ambassador Per Anger, who had worked with Wallenberg in Budapest. For more information about Jon Rush please visit Uniquely Michigan.